An American flies from the top of SpaceX's Falcon 9 rocket support structure at Vandenberg Air Force Base in California on Sept. 11, 2013. The private spaceflight company SpaceX joined Americans across the United States to mourn those killed in the terrorist attacks of Sept. 11, 2001, this afternoon with a simple statement and patriotic photo. 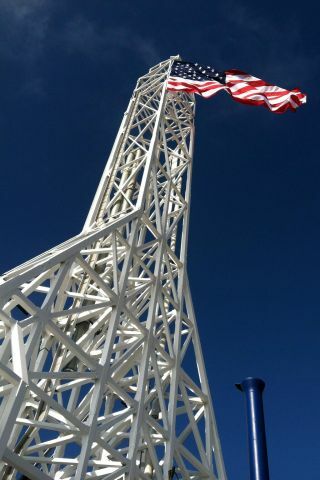 This afternoon, SpaceX took a moment from preparing for its first Falcon 9 rocket launch from California to fly an American flag from its launch tower. SpaceX officials posted the image to its Twitter page (@SpaceX) with the simple message: "Today, we look onward and upward, but #neverforget." The Hawthorne, Calif.-based SpaceX is preparing to launch an upgraded version of its Falcon 9 rocket from California's Vandenberg Air Force Base to loft the Cassiope space weather satellite for Canada. The rocket will launch on Sept. 15 and also carry a small satellite, called DANDE, built by students at the University of Colorado Boulder to study the drag effects of the Earth's upper atmosphere, known as the thermosphere, on satellites in space.